Casey Burton of North Allegheny comes back this fall with the best returning jump at 19-6. Burton followed up her 19-3 at WPIALS with that 19-6 at the state meet where she took second in AAA to Taylor Givens by 3 inches. An injury kept her out of the postseason during the winter, so the junior will be very motivated as we enter the spring season. A number of other strong AAA girls are back. North Penn's Natalie Kwortnik won the indoor state title last month. The senior jumped 19-3.75, the only girl over 19 during indoors, to capture the win. She jumped 19-4 to win the District 1 title a year ago before taking fourth at states. Perkiomen Valley's Christina Warren (sixth), Norwin's Jessica Kolesar (seventh), and Twin Valley's Jordan Walk (eighth) are among the returning AAA state medalists from last season. Central Dauphin's Gabriella Recce (18-7.75) and Conestoga Valley's Aviona Saunders (18-6.75) also have impressive jumps from last year and will be back to contend this spring in AAA. 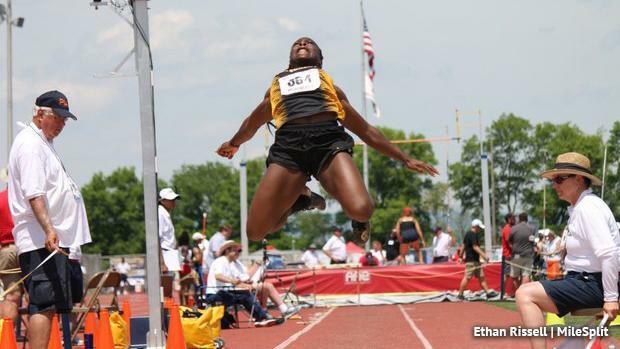 In AA, Breana Gambrell's historic four-year run atop the long jump podium will come to an end. She's off to Penn State, so there will finally be a new champ in the classification. Saint Basil Academy's Tia Taylor will look to fill those shoes. She missed out on state qualifying in the LJ last year (but did win the AA state crown in the 100m hurdles), but had a season best of 19-3, the best of any AA returner. She was third at indoor states. Expect her to make a run at 20 feet, like a few others in the state. There are four AA state medalists from last year that are back: Oswayo Valley's Sara McKean, Palisades' Lydia Bottelier (fifth), Penn Cambria's Lyric Janosik (seventh), and Loyalsock's Sophia Gardner (eighth). Janosik jumped 18-4.25 during the indoor season. Taylor's Saint Basil teammate Sasha Lee jumped 18-4.75 during indoors and picked up an eighth place medal at states. As for the independent schools, Springside Chestnut Hill's Olabisi Adams returns with a best jump of 18-6.25 from last season. She's the reigning Inter-Ac and PAISAA champion. Watch an interview with Burton from the indoor season and check out the top 1000 returners in the girls long jump below.